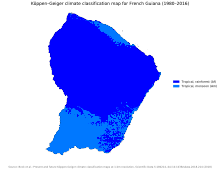 The history of French Guiana spans many centuries. Before the first Europeans arrived, there was no written history in the territory. It was originally inhabited by a number of Native American peoples, among them the Kalina (Caribs), Arawak, Emerillon, Galibi, Palikur, Wayampi, and Wayana. The first Europeans arrived in the expeditions of Christopher Columbus, shortly before 1500. French Guiana is not a separate territory but is both an overseas région and overseas department of France, with the same government institutions as areas on the French mainland. The administrative center is Cayenne. Cayenne is the capital city of French Guiana, an overseas region and department of France located in South America. 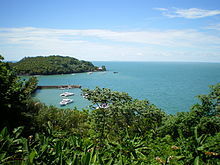 The city stands on a former island at the mouth of the Cayenne River on the Atlantic coast. The city's motto is "fert aurum industria", which means "work brings wealth". Saint-Laurent-du-Maroni (French pronunciation: ​[sɛ̃ loʁɑ̃ dy maʁɔni] is a commune of French Guiana, an overseas region and department of France located in South America. 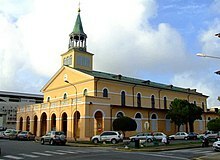 Saint-Laurent-du-Maroni is one of the two sub-prefectures of French Guiana and the seat of the Arrondissement of Saint-Laurent-du-Maroni. It is the second most populous city of French Guiana, with 43,799 inhabitants at the Jan. 2016 census. Saint-Georges is a commune of French Guiana, an overseas region and department of France located in South America. It lies on the Oyapock River, opposite the Brazilian town of Oiapoque. The town contains a town hall, a French Foreign Legion detachment and some hotels. Régina is a commune of French Guiana, an overseas region and department of France located in South America. With a land area of 12,130 km2 (4,680 sq mi), it is the second-largest commune of France. The Kalina, also known as the Caribs, mainland Caribs and several other names, are an indigenous people native to the northern coastal areas of South America. 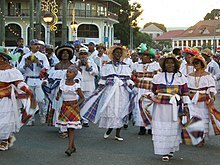 Today, the Kalina live largely in villages on the rivers and coasts of Venezuela, Guyana, Suriname, French Guiana, and Brazil. They speak a Cariban language known as Carib. They may be related to the Island Caribs of the Caribbean, though their languages are unrelated. Maripasoula is a commune of French Guiana, an overseas region and department of France located in South America. With a land area of 18,360 km2 (7,090 sq mi), Maripasoula is the largest commune of France, and is reportedly the fourteenth largest city in the world by surface area. 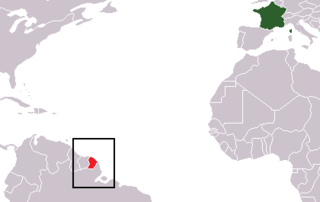 French Guianese Creole is a French-based creole language spoken in French Guiana, and to a lesser degree, in Suriname and Guyana. It resembles Antillean Creole, but there are some lexical and grammatical differences between them. Antilleans can generally understand French Guianese Creole, though the notable differences between the French creole of French Guiana and those of the rest of the Atlantic may cause some instances of confusion. The differences consist of more French and Brazilian Portuguese influences. There are also words of Amerindian and African origin. There are French Guianese communities in Suriname and Guyana who continue to speak the language. The Oyapock River Bridge spans the Oyapock River, linking the cities of Oiapoque in Amapá, Brazil and Saint-Georges-de-l'Oyapock in French Guiana, France. The bridge is cable-stayed, with two towers rising to a height of 83 metres (272 ft) and a length of 378 metres (1,240 ft). There are two lanes for vehicles with a total width of 9 metres (30 ft) and a pedestrian sidewalk with a width of 2.50 metres. The vertical clearance under the bridge is 15 metres (49 ft).